A modern vibe permeates the public and private spaces at the non-smoking Aloft Santa Clara which features free Wi-Fi and an outdoor pool. The non-smoking five-story Aloft is home to 175 rooms that boast sleek bathrooms free Wi-Fi 42-inch LCD TVs mini-fridges coffeemakers and work desks. The bold lobby has seating areas a bar with modern furnishings and a small snack shop. Guest can opt for a casual bite in the morning before getting to work in the business or fitness center. The outdoor pool offers year-round fun as does the billiards table. Additional ameities include free parking a 24-hour front desk and complimentary local calls. Pets are allowed for an extra fee and are welcomed with a dog bed and treats. 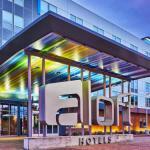 Less than four miles from I-880 the Aloft is 15 minutes from downtown San Jose. Nearby points of interest include Levi's Stadium a mile away and Stanford University 20 minutes away. Family-friendly attractions within 20 minutes include the fascinating Rosicrucian Egyptian Museum and the Children's Discovery Museum. Drive less than an hour north to spend the day in San Francisco home to Alcatraz Golden Gate Park and the Palace of Fine Arts. Guests reach San Francisco International Airport in 31 miles.